Chanteuse Country née le 21 Septembre 1967 à Jackson (Mississippi). Faith Hill was born Audrey Faith Perry on September 21, 1967, in Jackson, MS, and grew up in the nearby small town of Star. She was singing for her family as young as age three and first performed publicly at a 4-H luncheon when she was seven. Hill spent much of her childhood singing wherever the opportunity arose, influenced primarily by Reba McEntire, and at age 17 formed a band that played local rodeos. At 19, she quit college and moved to Nashville to make it as a singer, first finding work selling T-shirts. During this time, she was married briefly to music executive Dan Hill. Eventually she was hired as a secretary at a music publishing firm, where she was discovered by accident while singing to herself one day. Encouraged by company head Gary Morris, Hill became a demo singer for the firm and also performed professionally as a harmony Vocalsist behind singer/songwriter/producer Gary Burr, who produced Hill's own demo tape. A Warner Brothers executive caught Burr and Hill's act at a Nashville club, and wound up signing Hill to a solo deal. 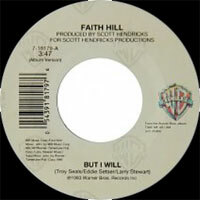 Hill released her debut album, Take Me as I Am, in late 1993, with producer Scott Hendricks at the helm. Success wasn't long in coming; the lead single "Wild One" raced up the country charts en route to a four-week run at number one early the next year, making her the first female country singer in 30 years to top the charts for that long with her debut single. The follow-up, a countrified cover of Janis Joplin's "Piece of My Heart," also hit number one, as did the album's title track, and Take Me as I Am wound up selling over three million copies. Hill was set to build on her success right away, but had to undergo surgery on her Vocals cords, which delayed the recording of her next album. Nevertheless, the wait wasn't unreasonable, and It Matters to Me appeared in the summer of 1995. The title track became her fourth number one country single, and it was accompanied by a string of Top Ten hits that helped push initial sales of the album past the three million mark. Hill was by now a firmly established country hitmaker, and she continued her active touring schedule by teaming up with Tim McGraw in 1996 for the Spontaneous Combustion Tour. It was an apt name, as Hill married McGraw that October. The couple's first child, daughter Gracie, was born in May of 1997, and not long after, their duo "It's Your Love" — recorded for McGraw's Everywhere album — was burning up the country charts, staying at number one for six weeks. Hill returned in the spring of 1998 with Faith, which provided the first signs that she was interested in crossing over to pop audiences, even if the still-countrified music often straddled the fence instead of making her ambitions explicit. The single "This Kiss" proved the savvy of her approach; not only did it top the country charts for three weeks, but it also became her first pop hit, climbing to number seven. By the time "This Kiss" had run its course on the charts, Hill had given birth to her second daughter with McGraw, Maggie. If Hill had been a star in the country world, she was now rapidly becoming a superstar, known not just for her music but also her pure celebrity; she also signed an endorsement deal with Cover Girl makeup. Her next two singles, "Just to Hear You Say That You Love Me" (another duo with McGraw) and "Let Me Let Go," hit number one country, though they didn't duplicate the pop success of "This Kiss." Faith, released in 1998, became Hill's biggest-selling album yet, eventually moving over six million copies and reaching the Top Ten on the LP charts; plus, it became crystal clear that Hill held major crossover appeal. Accordingly, she re-entered the studio immediately after her supporting tour and cut Breathe, a full-fledged bid for pop and adult contemporary success. Breathe entered the charts at number one upon its release in late 1999, and its title track became Hill's biggest hit yet; it spent six weeks on top of the country charts and was an even bigger hit on the adult contemporary charts. While it only climbed to number two pop, the single had such staying power that it wound up the biggest hit of the year 2000. The follow-ups were pretty successful in their own right: "The Way You Love Me" and "There You'll Be" both hit the pop Top Ten, with the former topping the country charts and the latter hitting number one AC. Hill also scored a Top Ten country hit with "Let's Make Love," a third duo with McGraw, and the two teamed up for another tour in 2000. Breathe was a bona fide blockbuster, selling over seven million copies in the U.S. and earning her a slew of award nominations. Hill spent much of 2001 taking a break and spending time with Audrey, her third daughter with McGraw. In 2002, Hill returned to the spotlight with her fifth studio recording, Cry, a three-million seller whose title track netted her the Best Female Vocals Performance Grammy for 2003. Hill took nearly three years to return to recording, but when she released Fireflies in August 2005 it was hailed as one of her finest works. The lead single "Mississippi Girl" (written by John Rich of the hit country duo Big & Rich) hit number one on the country singles chart, and the album reached number one on the album charts. Her Soul2Soul II tour of 2006, which she co-headlined with McGraw, became the highest-grossing country tour of all time, she released the holiday album Joy to the World, which debuted at 13 on the Billboard Top 200. Over the next few years, she continued to act -- she appeared in the 2015 film Dixieland -- and harmonized with McGraw while she chipped away at a new album. In 2016, she released a compilation of album tracks called Deep Tracks; it debuted at number 22 upon its November 2016 release. Early the following year, she announced a recording contract with Sony, and released "Speak to a Girl," the first song from a duets album with McGraw. 2000 CD Interscope INTR-10237-2 (US) (promo) Where Are You Christmas? 2000 CD Interscope FHCDP1 (EUR) (promo) Where Are You Christmas?